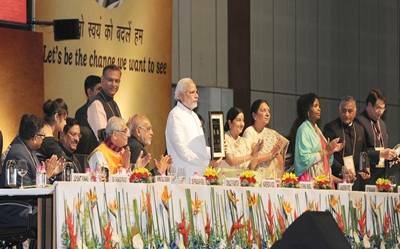 Gandhinagar, Jan 8 (IANS) Prime Minister Narendra Modi on Thursday recounted the example of an NRI from Surat who would diligently sweep and clean the roads of his ancestral village during his annual visits to India as an example of how the Indian diaspora can contribute to their motherland in even the smallest way. "The gentleman would take the jharu (broom) and clean all the rubbish and the people would make fun of him thinking he is mentally offa But this time when he came, and took up the broom as usual as soon as he landed, he was joined by others in the village," said Modi in apparent reference to the "Swachch Bharat" or Clean India mission launched by his government. He also said that generally a proposal takes two years to fructify but with his proposal took around 100 days to pass. "The world is keen to embrace India and this is a small example," he said and added that the people of India need to believe in their potential. He also recounted how a young NRI Muslim woman who visited Kutch during the 2002 quake in Gujarat stayed on for months and worked among the people to help in the rehabilitation efforts.